NAC is a thiol-containing amino acid; it is readily absorbed and is non-toxic. It has many beneficial effects; perhaps the most surprising is the likely ability of this molecule to destroy chlamydial elementary bodies. It is also a powerful antioxidant, and replenishes intracellular glutathione. It may also be effective in inactivating fungal gliotoxins. These properties are reviewed below. Chlamydiae are apparently unique amongst Gram negative organisms in possessing cysteine-rich proteins on the surface membrane of the spore-like EB. Cysteine is an amino acid containing a sulfhydryl ( S-H ) group; a disulphide bond ( S-S ) can form between two cysteine molecules. Such cross-linking bonds are common within and between the EB surface proteins. They are thought to preserve the integrity and shape of the EB. Furthermore, these disulphide bonds are accessible for cleavage. Why do chlamydial EBs have this surface structure? Structure, in the realm of the prokaryote, implies function: there is no room for ornament or unnecessary redundancy. Evolution works with swift efficiency at this scale. Reduction of these bonds disrupts the integrity of the EB's surface, and may be the mechanism by which the EB rapidly opens within the endosome. Rapidity is important, because the chlamydial body, now truly inside the host cell, must avoid fusion with the host lysosome or it will be killed. Raulston and co-workers have shown that the disulphide bonds between the chlamydial surface proteins must be opened up just prior to or during attachment to the host cell. [Raulston JE et al., Surface accessibility of the 70-kilodalton Chlamydia trachomatis heat shock protein following reduction of outer membrane protein disulfide bonds. Infect Immun. 2002; 70(2): 535-43.] The mechanisms of chlamydial attachment to the host cell membrane; its entry into the cell; its ability to rapidly open and to subvert host cellular activities; its ability to evade host-defences and to track actively across the host cytoplasm taking what it needs from various host organelles  as if it were in a department store  are fascinating to consider. The parasite probably uses an intricate system of microscopic syringes and needles (the type III secretion system) to inject subversional proteins into host cytoplasm to induce endosomal formation. (Other bacteria, easier to study - for instance, Shigella flexneri - do this by injecting proteins which cause the host-cell surface to ruffle, overarch and then seal behind the parasite.) Once the EB is in the endosome, time is of the essence; it has only a limited amount of preformed proteins and it must get to work metabolizing as fast as possible. It is reasonable to think that, were the EB coat to be opened up before achieving attachment to a nutrient-rich host cell, the unprotected EB would perish through starvation. N-acetyl cysteine, which, being a thiol antioxidant, is a good candidate for the reduction of disulphide bonds in EB coating proteins. It is readily available as a health supplement without the need for prescription. One indirect indicator of chronic infection with this organism is the N-acetyl cysteine test. This relies on the ability of NAC to rupture the extracellular Elementary Body by opening up surface disulphide bonds in the organisms geodesic coat, as described above. The EB opens and perishes. The release of naked bacterial components causes local inflammatory symptoms. Because EBs are more numerous in primary respiratory infections, the acellular load of EBs is likely to be highest around respiratory structures. In a positive NAC test the daily administration of 2.4 G of NAC will cause, after a few days, sinusitis-like symptoms, with watery mucous; also a cough productive of a clear, moderately viscous sputum. Systemic symptoms  'NAC flu'  may also occur. If symptoms are severe, the dose of NAC may be cut down to 600mg and slowly built up as may be tolerated. Symptoms wane, sometimes quickly, after a few days if the chlamydial load is small; if the load is large they may continue for a month or more as the EBs are destroyed and their remains removed by the immune system. As far as I am aware, NAC is unlikely to produce die-off reactions with any other genus. replenishing glutathione, a major intracellular antioxidant; see above. preventing further new infections with C. pneumoniae and thus averting the risk of MS relapse which this can produce. modulating the immune response, making cells more resistant to the effects of proinflammatory cytokines such as TNF-a. is itself a major antioxidant. It is non-toxic in standard supplemental doses. chelates heavy metals, which are known to accentuate oxidative stress. may moderate the effect of endotoxins, which are made by chlamydiae. Persons with a high EB load may experience a variety of symptoms as the EBs are ruptured and endotoxin and other bacterial material are released. Common symptoms include pain round the eyes and over the sinuses; wheezing and sputum production. This is not surprising, as the organism will have been in the respiratory tract - producing EBs- for a long time before it was forced to become a persistent intracellular form. Other symptoms depend on the location of the EBs, but joint pain, pain in soft tissues and abdominal discomfort have been experienced. Symptoms tend to last a month or so. N-acetyl cysteine and Gliotoxin, a poisonous metabolite secreted by Candida sp. This is one member of a large family of mycotoxins which cause damage to the immune system, provoking caspase-mediated apoptosis in monocytes and macrophages. Gliotoxin molecules contain a highly active surface disulphide bond which, on being reduced, damages host proteins by altering their structure. 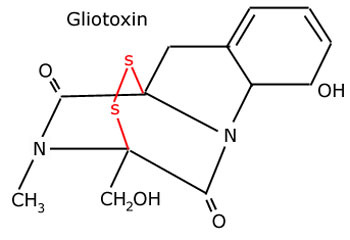 Gliotoxin may also deplete host glutathione, removing host antioxidant potential and increasing free radical damage; the molecule has been shown to oscillate between oxidized and reduced forms with the production of unstable peroxides. From the yeast's point of view the production of gliotoxin may be fundamental to the establishment of chronic colonization; locally high levels are found, for instance, in the genital tract of women with severe vaginal candidiasis [Shah DT, Glover DD, Larsen B. In situ mycotoxin production by Candida albicans in women with vaginitis. Gynecol Obstet Invest. 1995; 39(1): 67-9.] Gliotoxin is a potent neurotoxin, and may alter gut motility. It impairs the efficiency of host polymorphonuclear neutrophils [Shah DT, Jackman S, Engle J, Larsen B. Effect of gliotoxin on human polymorphonuclear neutrophils. Infect Dis Obstet Gynecol. 1998; 6(4): 168-75.] There is some evidence that intestinal gliotoxin may cause dysfunction of the gut barrier by damaging enterocytes [Upperman JS, Potoka DA et al., Mechanism of intestinal-derived fungal sepsis by gliotoxin, a fungal metabolite. J Pediatr Surg. 2003 Jun; 38(6): 966-70.] Gliotoxin has been shown to be a virulence factor in other fungal infections such as invasive aspergillosis. Gardiner and co-authors provide a very good overview of gliotoxin and related mycotoxins [Gardiner DM, Waring P, Howlett BJ. The epipolythiodioxopiperazine (ETP) class of fungal toxins: distribution, mode of action, functions and biosynthesis. Microbiology. 2005 Apr;151 (Pt 4): 1021-32.] the full text of which is available as a pdf file. Caveat There is confusion over the term gliotoxin. The term was first used in the 1930s to describe a toxic metabolite of the fungus Gliocladium fimbriatum; the name is derived from the name of the organism. This toxin is the small molecule with the heterocyclic nucleus spanned by a disulphide bond as described above. Unfortunately the same name  gliotoxin  has also been applied to a protein, toxic to the glial (gliocyte) classes astrocytes and oligodendrocytes, which has been found in the CSF of persons with MS [Menard A, Amouri R, Dobransky T, et al., A gliotoxic factor and multiple sclerosis. J Neurol Sci. 1998 Feb 5; 154 (2) : 209-21.] These two toxins have categorically different structures and have nothing in common except their name. Despite this, Internet articles have appeared which assume a common identity and which forward the assertion that mycotoxins have been demonstrated in the CSF of persons with MS.